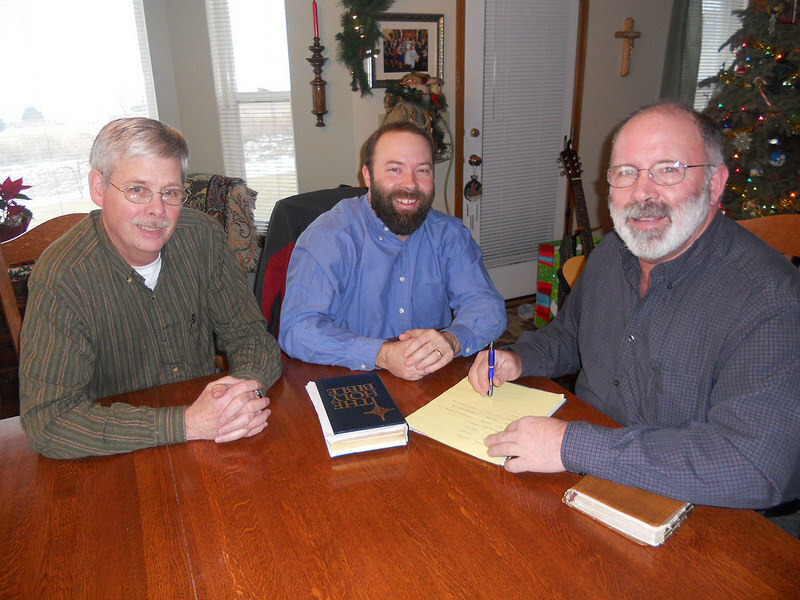 Mike Hays, Jeremiah Orthmann and Gerry Orthmann met with Ron Rice to plan their men's group outreach. Story by Chris Meehan and Elizabeth Grams. Photo by Ron Rice. The men of the Yakima branch are proclaiming the Gospel in a new way to men in their city. Their method is simple: bring them to men's group. Once each month, the men in Gerry Orthmann's men's group which also includes Mike Hays, Ron Rice and Jeremiah Orthmann invite other men to join them for brotherhood, discussion and prayer. They've been holding these meetings since the spring of 2014. Typically six or eight guests attend each month, and several have started coming regularly. "A couple of years ago I thought the Lord was prompting me to do something new with my men's group," recalls Gerry. "I talked to the guys about what I'd been thinking. Over the years we had invited men to different kinds of activities and events, but we could never really get any traction with those efforts." The group prayed and talked for several months before settling on the idea of an open men's meeting-an idea that Gerry says a friend in Servant Branch, Colin LaVergne, passed on to him. They scheduled their first meeting last May. "We had invited several guys to join us--neighbors, co­workers and guys from our churches," says Gerry. "We weren't really sure how many men would show up, but by 7:00 p.m. we had 10 guys sitting in my living room wondering what was about to happen. I talked very briefly about who we are as People of Praise and about how our men's group is an important way for us to share life and build friendships as Christian men." Then Gerry showed a YouTube video of a skit with two men acting out a conversation between Jesus and Peter. "After the video I led a discussion about Peter being a regular guy like us and having a very personal relationship with Jesus. We had a great conversation about growing in our relationship with the Lord. As they left, some said they really liked it and asked when they could do it again." In June, 12 men came to grill bratwursts on Gerry's porch. At the gathering in July, Gerry gave a short talk on being a Christian man, followed by a discussion. The next month, the men gathered in a local restaurant. Some of the guests had expressed interest in growing in their friendship with the Lord, so the group talked about how to get started with daily prayer and Scripture reading. Since the summer, the men’s group has continued to plan together for each open meeting according to the needs of their guests. Often the meeting includes a short explanation about the People of Praise (if there’s a new guest), a short talk, discussion, sharings, intercessory prayer and, always, food. When inviting guests, Mike says, "We let them know that it's the People of Praise that sponsors this. We tell them that we're an ecumenical community so they know where we're coming from." They do this ahead of time, so the guest can "hit the ground running," as Gerry puts it, when he shows up at the meeting. The group has agreed that, if a brother issues an invitation, he is responsible for reminding that man, offering him a ride, and perhaps following up with an invitation to breakfast or a Lord's Day opening. "We find that men are yearning for this kind of thing," says Jeremiah. The meeting "enriches their faith and appeals to them." He adds that the meetings have also strengthened their regular men's group meetings which continue as usual the rest of the month, and been good for him personally. "Being there gives me a jumpstart! It gives me the feeling of a larger brotherhood. It keeps us fresh and optimistic." Gerry says, "We tell these men that we're just regular guys who love God, who want to live our lives as Christian men and want to share our lives with other men. That seems to make a lot of sense to them. It's been awesome to see the Lord working on these guys. We put in the effort, and clearly the Lord is right in the middle of it." Thanks for sharing this Gerry. Very encouraging. a great outreach, glory to God! Very encouraging and clever, sounds like a plan. Awesome! We will be discussing this in our Men's Group. Inspired. How unthreatening! "Come on over to my house. This is how we hang out."